The behavior of managers-such as the rewards they obtain for poor performance, the role of boards of directors in monitoring managers, and the regulatory framework covering the corporate governance mechanisms that are put in place to ensure managers' accountability to shareholder and other stakeholders-has been the subject of extensive media and policy scrutiny in light of the financial crisis of the early 2000s. However, corporate governance covers a much broader set of issues, which requires detailed assessment as a central issue of concern to business and society. Critiques of traditional governance research based on agency theory have noted its "under-contextualized" nature and its inability to compare accurately and explain the diversity of corporate governance arrangements across different institutional contexts. 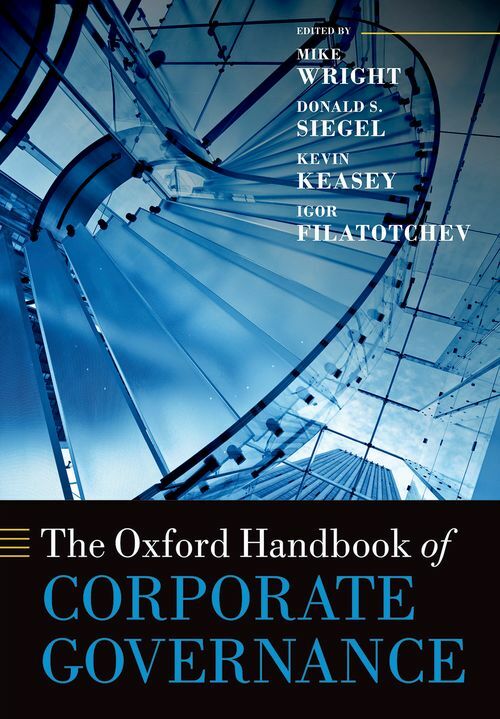 The Oxford Handbook of Corporate Governance aims at closing these theoretical and empirical gaps. It considers corporate governance issues at multiple levels of analysis-the individual manager, firms, institutions, industries, and nations-and presents international evidence to reflect the wide variety of perspectives. In analyzing the effects of corporate governance on performance, a variety of indicators are considered, such as accounting profit, economic profit, productivity growth, market share, proxies for environmental and social performance, such as diversity and other aspects of corporate social responsibility, and of course, share price effects. In addition to providing a high level review and analysis of the existing literature, each chapter develops an agenda for further research on a specific aspect of corporate governance. This Handbook constitutes the definitive source of academic research on corporate governance, synthesizing studies from economics, strategy, international business, organizational behavior, entrepreneurship, business ethics, accounting, finance, and law. 10. Executive Compensation and Corporate Governance: What Do We "Know" and Where Are We Going? Mike Wright is Professor of Entrepreneurship at Imperial College Business School and Visiting Professor at Erasmus University and University of Ghent. He is Director of the Centre for Management Buy-out Research, which he founded in 1986. He was conferred with the Award of Academician of the Academy of Social Sciences in March 2011. He has published 50 authored/edited books and over 300 academic papers on corporate governance, academic entrepreneurship and technology transfer, venture capital, private equity, and related topics in leading international journals. He is currently an editor of Strategic Entrepreneurship Journal. His latest books include Private Equity Demystified (with John Gilligan, 3rd edition, 2012) and Entrepreneurship: Perspectives & Cases (with Paul Westhead, 2011). He was ranked #1 worldwide for publications in academic entrepreneurship 1981-2005 and for entrepreneurship 1995-2006. ; Donald S. Siegel is Dean of the School of Business and Professor of Management at the University at Albany, SUNY. He received his bachelor's degree in economics and his master's and doctoral degrees in business economics from Columbia University. Dr. Siegel is editor of Academy of Management Perspectives and the Journal of Technology Transfer, an associate editor of the Journal of Productivity Analysis, and serves on the editorial boards of Academy of Management Learning & Education, Journal of Management Studies, Journal of Business Venturing, Corporate Governance: An International Review, and Strategic Entrepreneurship Journal. He has also co-edited 31 special issues of leading journals in economics, management, and finance, and published 6 books, including most recently Innovation, Entrepreneurship, and Technological Change and the Oxford Handbook of Corporate Social Responsibility (both Oxford University Press). ; Kevin Keasey is Head of the Accounting and Finance Department and Director of the International Institute of Banking and Financial Services, the University of Leeds. He is the author of 11 books, monographs, and edited volumes on corporate governance, financial regulation, financial services, and financial markets, and is the author of over 115 refereed articles in leading international journals and over 80 other publications (such as book chapters, reports). ; Igor Filatotchev is Associate Dean and Professor of Corporate Governance and Strategy at Cass Business School, City University London, and Director of Centre for Research on Corporate Governance at Cass. He has published more than one hundred refereed academic papers, in addition to numerous books and book chapters, in the fields of corporate governance and strategy including publications in leading academic journals such as Academy of Management Journal, Academy of Management Perspectives, Strategic Management Journal, Journal of International Business Studies, Organization Science, California Management Review, and Journal of Management. He is an Associate Editor in Corporate Governance International Review and Journal of Management and Governance. His most recent book is Corporate Governance and the Business Life-cycle (Edward Elgar, 2010).